Most parents with young children work outside the home. So they need an affordable, high-quality, easily accessible place to leave their kids while they work. The average cost of full-time daycare for kids up to the age of 4 has reached $9,589 a year, according to a new report from the think tank New America. That now tops the average cost of in-state college tuition, which runs about $9,410. That means parents earning the national median household income (a little north of $53,000) would need to shell out 18% of their income for the care of just one child. The younger your child, the higher your bill. Infant care costs about 12% more than toddler care. It ranges from a low of $6,590 a year in Arkansas, or 15% of median state income; to a high of $16,682 in Massachusetts, or about 25% of median income there. And, of course, the lower your income, the higher your level of stress over footing the bill. Minimum wage workers, on average, will have to fork over nearly two-thirds of their pay for child care. Having a nanny at home will cost far more - an average of $28,353 a year. Put another way, that's more than half of U.S. median household income, 188% of the income for a single minimum wage worker or three times the cost of average in-state college tuition. The authors of the New America report stress the value of early care to foster a child's brain development and ability to learn. "An effective system should be built on three pillars: affordable cost, high quality and easy availability. That is not happening in the current fragmented, patchwork system," they wrote. Only 11% of child care centers nationwide are accredited, the report said. And 20% of families said they use more than one child care arrangement in any given week, both paid and unpaid. The top five states with the highest overall care score are Connecticut, New Hampshire, Massachusetts, Rhode Island and Minnesota. The bottom five states with the lowest overall score are West Virginia, Mississippi, New Mexico, Nevada and Oklahoma. For the first time, the issue of how to make child care more affordable is getting serious attention in a presidential election. Hillary Clinton and Donald Trump have now both proposed a few ways to get at the problem - although their proposals are very different. 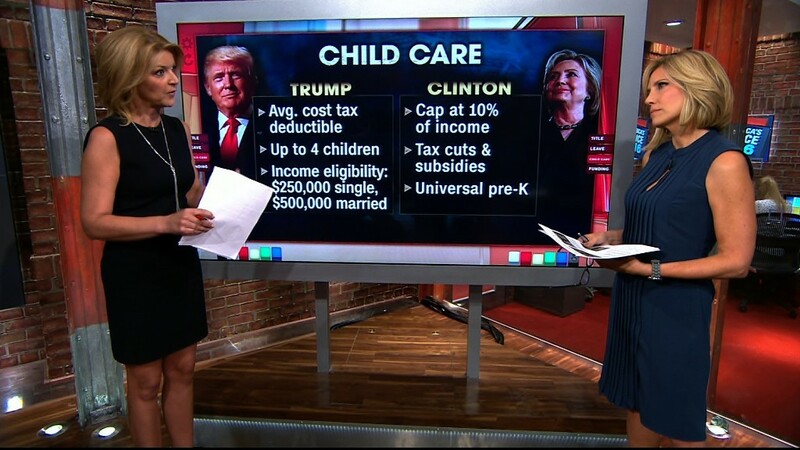 Clinton wants to cap the cost of child care at no more than 10% of a family's income up to a certain amount. She also wants to guarantee 12 weeks of paid family leave and universal pre-K for 4-year olds. Trump would let women who have babies collect six weeks of unemployment benefits if their employers don't offer paid leave. Working and stay-at-home parents could take a deduction for their child care costs. And families could save up to $2,000 a year in a new tax-advantaged account to cover costs for child care, private school tuition or after-school programs. For her part, Clinton still needs to offer more specifics on how her plans would work. And Trump needs to tweak his proposals to better help low- and middle-income families who need the help the most. But that both candidates have put forth real proposals is a step forward in the national conversation on the issue, child care advocates noted.